Intimate, precious and heartfelt. All in one image. There exists an almost…interdimensional relationship between a photo, its subject and the photographer. As a 4 episode ‘healing (iyashikei)’ OVA, envisioned by the same creator who had directed Aria the Animation, Tamayura’s story is a simple tale of finding one’s passion, the journeys one must undertake in order to find their purpose, and of course…the mysterious wanders of the 150 year old art form that we call photography. As an inspiring and self-proclaimed amateur photographer myself, this OVA struck home on multiple occasions regarding my hobby and offers a multitude of inspiringly beautiful moments and messages, that not everyone will be able to truly appreciate and understand. There are shows that rely on deep-reaching plotlines and blood pumping action, others that rely on non-stop comedy and plot twists. Tamayura is a show that invites you to slow down, and smile as your heartbeat slows to match the tempo the show offers you, in addition to a wonderfully simple and colourful story that proceeds to relax every single muscle in your body, whilst also offering you messages of artistic inspiration. Escapism is a common initiator for interest in visual mediums such as anime, and as are most things in this world: escapism comes in many forms. The human imagination forces individuals to seek and experience the new and to find that unique spark that proves their individuality in ways that’s beyond the chemical, atomic and the biologic. Amongst the fantastical adventures of space operas, demonic realms where gods and devils do battle, most; if not all; endearing stories always find their roots in the intimacy of human relationships and the purity of unspoiled human compassion. So, when the impurities of conflict were kept out of the thematic experience, Tamayura’s setting on a realistic platform is left with a grounded atmosphere that feels ironically surreal: the definition of escapism from conflict altogether. 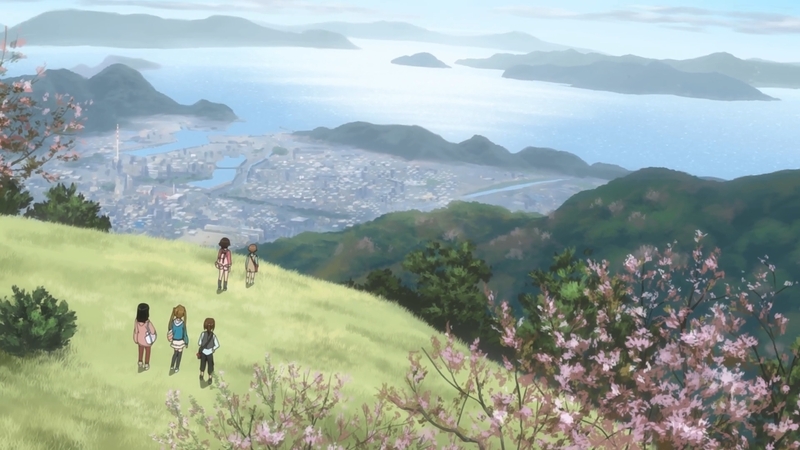 The true enjoyment of the Slice of Life genre is appreciating the magic and adventures that normal lives can offer: passions that allows individuals to find inspiration and beauty in the mundane and the typical. Tamayura’s thematic foundations very much constructs itself upon an almost overwhelming sense of childish bliss and precious intimacy, and every element of the experience is tailored to reflect that: from Fu (our main female lead)’s simply worded monologues and her almost tooth-achingly sweet optimism, to the endearing tone of the first episode’s title: ‘The town with a lot of things that I love.’ Every element of Tamayura’s introduction (and the entire OVA, in fact) is premeditated to maintain this sense of beauty in simplicity, whilst also signalling a journey, in response to passion’s callings. Riding a bike non-stop without looking back, and without knowing the definite destination, is very much an adventure in itself. To briefly analyse every goddamn detail from the first 5 minutes of the first episode, let’s start with the opening footage. Tamayura’s artistic canvas very much draws inspirations from the blurriness of early childhood memories, starting with its rough, hand-painted visual elements serving as its background artwork. The first 30 seconds consists of Fu’s opening monologues, innocently citing the mysterious nature of photographs, with footage panning across bamboo-framed photographs of various landscapes, above vintage camera models. Interestingly, the opening footage also features the focal point of the entire OVA: a vertical portrait of Fu’s father, and the illuminated spots (common imperfection in analogue photographic films) that surrounded him when the camera captured the shot. Finding perfection in imperfection is perhaps an unintended analogy when Fu revealed her belief, that these ‘tamayuras’ only appear, when the moment captured is truly perfect, but it successfully resonates with the OVA’s identity as a Slice of Life title. Actually a still from Tamayura ~hitotose~, sequel to the OVA, but HEY, more Tamayura FTW. The OP sequence of Tamayura takes the liberty of adapting the Ghibli icon, Kiki’s Delivery Service’s ED song, performed here by Sakamoto Maaya, which accompanies a calmly composited set of imagery that finds inspirations from the real life town of Takehara. Rather fitting, considering the similarity in themes of self-discovery, which both titles share. Also rather fitting: the OP’s flavour is dusted with creative choices of photograph frames and portraits featuring Fu’s family and friends, not long after showcasing Fu’s trademark camera, the Rolei 35S. There exists an abundance of nostalgia in the OP sequence, simulating the long-past memories of years gone by, resurfaced by the collection of rediscovered images and the intimate personality of the featured location. Such viewer responses are amplified by the inclusion of the bicycle: taking a few pages from the similarly toned show, Honey and Clover, the bicycle’s brief appearance in the OP and the first few minutes of the episode very much adds to the subtle symbolism that the OVA utilises in showcasing its themes of self-discovery: the human endurance-powered transport and its motivational prominence in Honey and Clover; and by extension, here; very much offers the observation, that riding a bike non-stop without looking back, and without knowing the definite destination, is very much an adventure in itself. Then there’s the inspirational message to enjoy the unintended tangents from the planned path, and enjoying the journey before reaching the destination, but we will discuss that with more thematic stimuli featured in the OVA. Our first true introduction to Fu was seeing her chasing a floating dandelion seed, pretend-framing it with her fingers. This extended scene achieves a multitude of cinematic developments, by presenting Fu as a creatively active (and absent-minded) girl, and a sense of sentimental empathy in the emotional impact of seeing dandelion seeds in cinematic mediums: they are fondly part of childhood’s bliss, whilst also possessing the storytelling associations of freedom and flight. Let’s face it…we all sent these things flying with our breathes when we were kids…and we are still doing it, now. The musical score remains a relative forefront in the soundscape, welcomingly extending its thematic significance in the emotional climate inhabited by the viewers. Accompanying the images onscreen, is an intimate ensemble of instruments which combine their tones and personalities, to create a suite of background musical pieces which heightens the relaxed emotional ambience, which the show has placed the audience under the spell of. The opening sequence is guided by a stream of simple piano melodies, with each verse transcending nostalgia. The ending note to each verse is a lone and echoing high-pitched call to eventual silence: almost suggesting a longing voice to be set free. The track after the OP also retains the intimate personality of the OST, but adding in a sense of optimistic energy with a multitude of instruments joining the ensemble: the combination of a clarinet solo, acoustic guitar, chamber strings section and piano, the resulting melody simply oozes with a sense of joyful homeliness, whilst also adding to the slightly melodramatic tone, which the show introduces in tiny sips throughout the episodes. Also throughout the OVA, the musical score remains a relative forefront in the soundscape, welcomingly extending its thematic significance in the emotional climate inhabited by the viewers. Perhaps the single most important element of cinematic perfection of which Tamayura achieves, is what I consider to be its incidental messages of artistic inspiration, successfully planting seeds without most of us noticing. Amongst the episodes, while Fu and her friends banter and goof around various sites and locations (including visiting a photograph gallery of a photographer that Fu admired), innocently enjoying their lives, tiny incidents of a seemingly frustrating nature briefly hamper the otherwise perfect experiences: them getting continuously lost whilst on road trips, and Fu accidently rolling her ankle, having to be carried by an adult. The emotional power behind the seemingly mundane events of a truly great Slice of Life show, is achieving memorability with heartfelt sincerity. But something tells me, that the older sister in charge of their expeditions was intentionally not following the map, just to give her group a sense of living outside schedules and plans. Luck and fate did the rest, as Fu made her miraculous discovery (or a sudden flooding back of memories) whilst holding onto the shoulder of the photography store owner, with her leg bound in a makeshift cast. These tiny moments of emotional payoff successfully offset the contrived nature of many stories, by hiding them behind tiny moments of incidental events, and delivering the blow with a sense of naturally felt grace and goodwill. The emotional power behind the seemingly mundane events of a truly great Slice of Life show, is achieving memorability with heartfelt sincerity, and without exaggerated drama, conflict nor sudden fireworks-aided epiphanies. 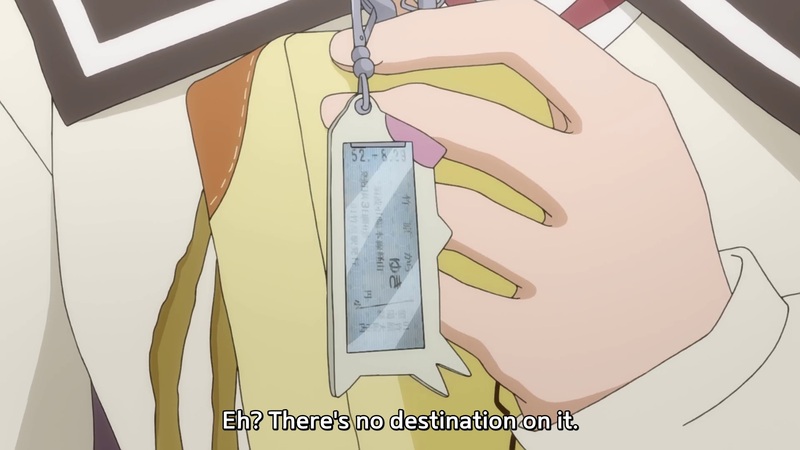 And yet after all that, the one true centre of Tamayura’s story, resides in what Fu keeps strapped to her prized camera: a ticket with no specified destination. The significance behind this memento from Fu’s photographer friend and idol, are the oh-so-obvious messages which visual storytelling would usually also associate with the depiction of trains and train lines: the journey’s passing sceneries beyond that window, will always be eternally more beautiful and interesting than lusting for the arrival. Of course, Tamayura also presents this symbolic object as an allegory to finding one’s own unique destinations in life, a message which retains its own unique beauty. So, how should one see Tamayura? Well, for me, it’s a quietly passionate love letter to flowering artists. One of my favourite sayings and beliefs is that when it comes to love and passion, stating the obvious is a beautiful thing. The painfully idealistic nature of Tamayura doesn’t even come CLOSE to achieving realism in an objectively thematic sense, but in a creatively empowering sense, it’s idealism that help propel the collective human race forward, whether it be socially, creatively, scientifically or politically. Thus, I shall conclude by presenting the OVA (and by extension: both TV seasons and the still releasing 4 part movie series) with one final praise: it is a truly heartfelt ode to all photographers, artists and storytellers everywhere. This is not bad stuff! I appreciate what you wanted to say about this show and its overall message, as well as some of the moments that you pulled to showcase it. I would say, though, that a lot of this post feels sort of disconnected. Sometimes you talked about scenes without totally describing why they connected to your overall “thesis,” and other times you explained why something about the show is good without really showing why. In the end, I felt like this could’ve either been a lot shorter, tighter, and to the point; or otherwise a lot longer and more detailed (it’s pretty short for a “thesis” anyhow hehe). I think you could’ve gotten more mileage out of talking about yourself and your relationship with the show and really selling why you think this show is important for a young photographer; or why, as you put it, “that not everyone will be able to truly appreciate and understand.” Also, only semi-related: that snow effect is really distracting while trying to read lol. Anyways, apologies for turning into unsolicited critique, but I definitely think you’ve got some capability of translating what a show means to you and why, but that it’s something which could be honed. At the end of this post, I kind of understood why Tamayura is a good show to watch for inspiration, or that it was setting out to be one, but I never really got a sense of in what way it actually inspired you and what you got from it.